Facebook is one of the best social networking site. It provide spam free and safe environment. Developers are working day and night to improve it. Although, it's very hard to break Facebook security but we can't take any guarantee. Nothing is impossible. As like developers, hackers are also trying to find different ways to hack into Facebook security. You might have heard hundreds of reports about Facebook hacking. It's not necessary that hackers will target officials and celebrities only. Sometimes, normal people are also targeted and their accounts are generally used for spam purpose. It's easy to hack normal user as they have very low security protection. 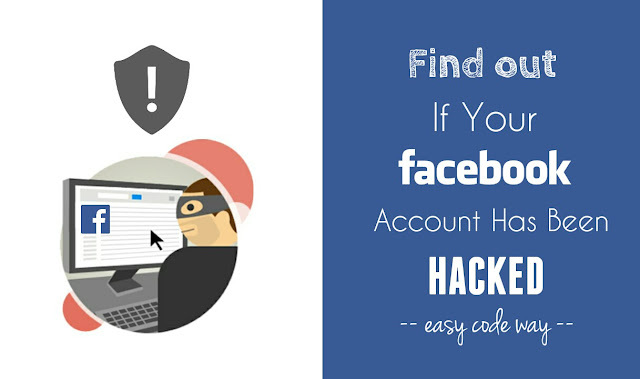 Well if you think your Facebook account has been hacked and you want to find out what actually happened, then this tutorial will guide you how to investigate the case. These signs are enough to prove that you're hacked. 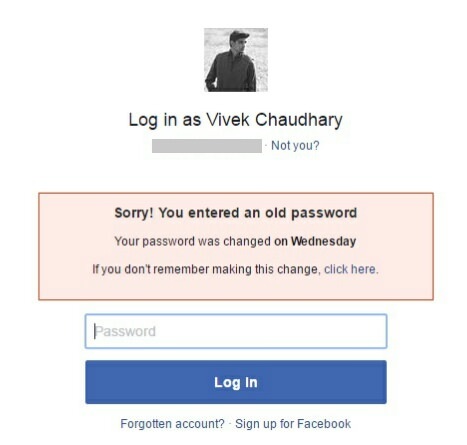 Assuming that you haven't checked your Facebook account, first thing you need to do is to login. Simply go to the Facebook sign-in page and enter your email address and password. If you're able to access your account, this doesn't mean that you're not hacked. There is a possibility that hacker may be using your account without changing its password. On the other hand, if you got an error message as "Sorry! You entered an old password. Your password was changed on [date]. If you don't remember making this change, click here" while logging in, there is a clear sign that someone has hacked you and he has also changed your password. In that case, you should immediately request a new password to recover your account. It's very simple. Follow the link to request a new password on your registered email address or mobile number. Note that, if you're using same password everywhere (like on other social networking sites, such as Twitter or Instagram), please change their passwords also. 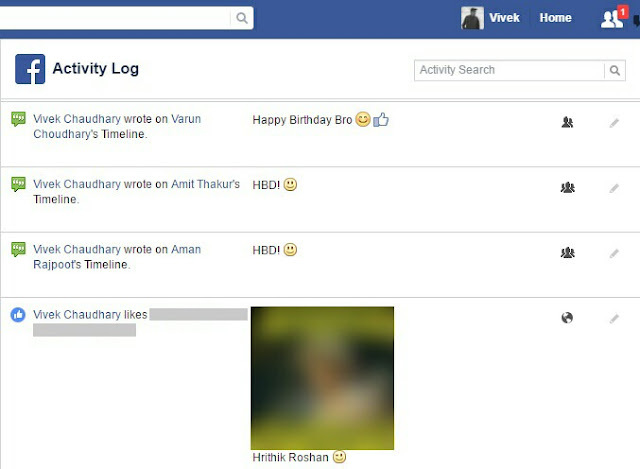 Facebook keep record of all your activities like which posts you've liked, where and what you've posted and much more. If you can login to your account, you've to check activity log to review all your past activities. In most common cases, hackers use account for spam purpose. They may post on your timeline and groups, messages your friends or follow unknown people and pages. You can review all these things in your activity log. To open it, first go to your profile and click "View Activity Log" button in front of your cover photo. From this page, you've to review all your account activities manually. You can also filter them from the left sidebar menu to choose a particular type of story (ex: likes, posts, pictures). If you find something different that you hadn't done, this means that someone has used the account in your absence. There are two possibility. Either you're hacked or some apps (those you've given permission) are using your account for spam purpose. For example, if you're using auto liker or other automated bots, you'll automatically start liking unknown posts. I had already posted an article on how to remove such auto liker apps from your Facebook account. If you're facing the same problem, immediately change your password and revoke all unwanted app access to your account. To do that, first click the drop-down arrow icon at the top-right corner of the webpage (the same button from where you logout your account) and select "Settings" option. Now move to "Apps" tab from the sidebar menu. Here you'll find all the apps and games that you've given permission earlier. Now hover to the app you would like to remove and click the cross icon (x) next to it. After some time, re-check your activity log again and hopefully, you should not find such unknown activities anymore. If the problem persists, deactivate your Facebook account for some time so that other automated bots will automatically stop linking to your profile. As like activity log, Facebook also record active sessions. You can find out where your account is logged in at present. To find it, again go to the settings page and click "Security" option from the sidebar menu. Now click the edit link next to the "Where you're logged in" option and here you'll find complete list of all your active sessions. 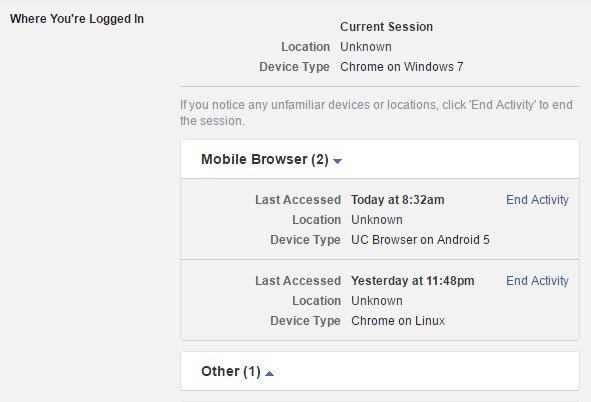 Each session contains three information about the last accessed time, location and the device type (including both browser and device name). Now check and review all active sessions. Make sure that they are all yours. If you find an unfamiliar device or location, you can remove its session any time. After removing it, your account will be logged out automatically from that particular device or browser. It is recommended to change your password also. In trusted devices, you won't be notified or have to confirm your identity if you've enabled two-step verification. Hacker may have added his device in a trusted device list. To review it, go back to the security page and click the edit link next to the "Your Browsers and Apps" option. Here you'll find all your trusted devices list along with their date information from day one when your account was created first time. If you find any unfamiliar browser or app, immediately remove it by clicking "Remove" option next to it as you may be hacked. This works in the same manner as active session works i.e., after removing it, your account will be logged out automatically and then, the hacker has to pass the security check as usual to complete the login process. Next two methods are for those people, who can't access their account and want to find out whether it has been hacked or not. 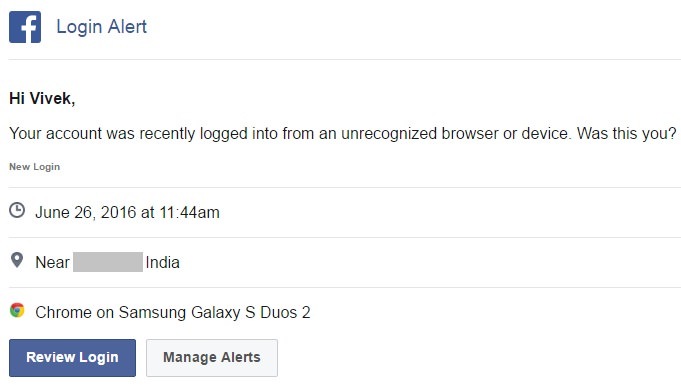 If you've enabled Facebook login alerts via email, you'll receive an email in your inbox each time when someone (you or the hacker) will try to access your account. To find who has hacked your Facebook account, simply login to your email service (such as Gmail or Yahoo!) and review all your login alert mails. Here you'll definitely find the hacker login details (such as date and time, location, device and browser or app name). You can recover your account by requesting a new password any time. Last but not least, you can ask your close friends about the issue. As already mentioned, some hackers use hacked accounts for spam purpose. They may post and message unnecessary things. Your friends might have seen or received those messages or posts from you. If something like this happens, that means your Facebook account has been hacked. In this way, you can easily investigate the case. If you've any doubts, please drop me in below comment box. Did I had missed something? Is your account hacked or not? How did you recovered it? Let me know! Stay tuned for more interesting tutorials.